This is a difficult time of year for all who worship in the Social Justice temple: exams; stretching our antidepressants before stipends resume in the new year; Christmas. Christmas is the real problem. Many Warriors have to leave the safety of their college dorm due to “family obligations.” Attention Parents: Just because you are paying for college doesn’t give you the right to demand things from your children. You used to know this. What happened? Yet stressed activists surrender to the call. They abandon the internet, where they are fully supported by benevolent corporations like Twitter, Facebook, and Google, and quickly discover themselves in a place that demands face-to-face interaction and responsibility. Can you wrap this? Please set the table. I think you can do your own laundry. Force the relations to celebrate portions of Festivus to maintain family harmony. Make the “airing of grievances” epic. The dinner table conversations are equally problematic. Your grandfather, who survived 18 months in Viet Nam, is never going to agree that a campus protest to enable confused men to use the ladies room constitutes bravery! Deal with it. The worst, of course, is yet to come: Christmas Eve. Santa Claus will soon be forcing his rotund-white-cisnormative-male buttocks into your safe space. What will he do when he is there? Steal cookies and leave problematic non-gender-neutral toys under a murdered tree. Santa Claus is the epitome of the white male capitalistic patriarchy we are all forced to live under. Let’s examine why. Santa runs a surveillance program that involves parents watching children so they can be categorized on the binary naughty/nice list. This is oppressive for two reasons. First: it favors boys. Nice women don’t make history. Do you really think Hillary is getting anything but coal in her stocking? Men, on the other hand, face no such handicap. Second: it reverses the natural order of children spying on parents and reporting violations of social justice diktats to their teachers. Santa runs labor-exploiting toy factories and planet-destroying coal mines. The propaganda films make it look glamorous and the elves sure do look happy in them. Don’t be fooled. The Huffington Post ran an article a couple weeks ago revealing the truth. Elfish standards of living haven’t increased in real terms since their shoe-making days in medieval Europe. North Pole coal mines and massive holes in the ozone layer at the very same place? Only a paid Exxon lobbyist could not see these as related. In addition, the Environmental Protection Agency has practically outlawed coal, yet Santa Claus illegally imports more of it every year. Santa’s mode of travel isn’t environmentally-friendly. Do you know the volume of greenhouse gases his reindeer have to produce to generate the thrust required to get a sleigh, magic present bag, and their jelly-jiggling master off the ground? They do this millions of times in one night. 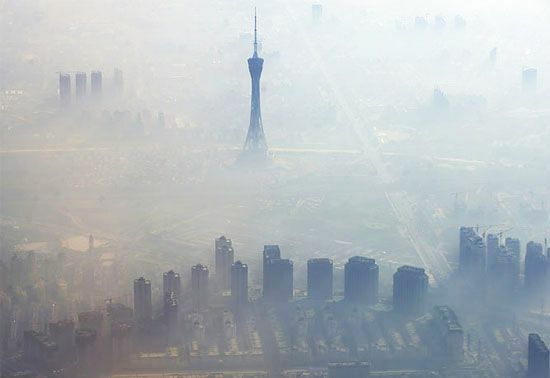 Just in case you missed the pictures of Beijing from December 25, 2014, we’ll run them again. Everyone should have the ability to protect themselves from the Red Menace. You’d think the police would do something. After all, the B&Es take place in the same night and are announced well in advance. Yet if you call 911 you’ll be the one arrested, unless they’ve changed the law in the last couple of years. No longer. Elon Musk, inventor of the Tesla Electric Car and Hyperloop Train, has done the world a great service once again. He has developed a defense drone capable of deterring or even capturing reindeer-powered sleighs. 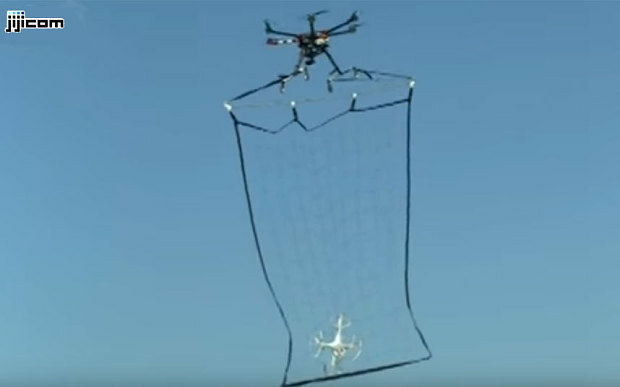 This picture shows the drone in action, capturing a test drone Santa stand-in for proof-of-concept. Santa-stopping drone courtesy of jiji.com. Santa not pictured. CHORF Mountain HQ will act as a test site this year. Should we actually capture Santa Claus we’ll turn him over to the United Nations IPCC for a highly-visible and decisive show trial. Reindeer will, of course, be released back into the wild. Musk is hopeful that everything will go as planned and no trace of Santa will be found in the ol’ HQ on Christmas day. Widespread availability and deployment will begin in October, 2016. The price point isn’t as low as we’d like, so CHORF Mountain HQ is pleased to announce the formation of the Stop Santa Kickstarter. We’re inviting like-minded individuals to join with us to lobby congress for subsidies. Kickstarter premiums will include SS uniforms and modern hipster badges. We should all be safe from Santa. Ohh. that’s so well done. Cracking up hard here. Green Onion, I must take exception here. These are no doubt captive breed and raised deer. These deer have been given shelter, food and companionship in exchange for working for a couple of days a year. They trust humans. They do not know where to look for natural food. They do not know what predators to watch out for. They are in fact big pets. As such, they will lack critical survival skills that a wild born deer would have. If you do in fact manage to “release” these animals without take the proper time to rehabilitate them, you will condemn them to a slow death or worse becoming a polar bear’s lunch. If you have managed to gain possession of these deer, please contact your local Department of Wildlife immediately and request to be put in contact with a properly trained Reindeer Rehabilitator (magical division if possible). As this may take a couple of days, you will be required to house the deer in proper accommodations until they can be transferred. Check with your local state and municipal ordnances to ensure that it is not illegal to house these animals on your premises. If it is determined that you have improperly released unrehabilitated reindeer into the wild you can be charged with cruelty to animals (sub class magical) and may face penalties of fines and possible prison time. On behalf of World Wide Wildlife Rehabilitators, thank you. – please keep the wild in the wild. I double-checked with my Enviro Studies prof and she says you are mistaken here. Global warming has killed all the polar bears. The reindeer will be perfectly safe. Besides, the stronger the feelings about our actions, the stronger the magic in their outcome. Studies have been done on this correlation by experts. EXPERTS! The science is settled. Just in case, we’ll tweet a “Free the Reindeer” meme before releasing them into the wild. That will assure their survival because everyone will be aware that we did it. Ah, signalage of PAN (Peoples Animal Network). PAN, and related groups/like minds have been determined to be more interested in Image and Money than in the health and welfare of our precious wildlife.